Sick of the constant hassle of scraping and painting your wood siding? Ready to upgrade from your tired 1960s aluminum siding? Just want to change the look of your home with fresh vinyl siding? It’s time for new house siding, installed by the professionals at Northshore Window and Siding! Siding replacement is the fastest and easiest way to change the appearance of your house. You can completely transform it or just revitalize its current look. The choice is up to you, but the experts at Northshore Window and Siding would love to help! Although some expert do-it-yourselfers are capable of properly installing siding, we highly recommend professional siding contractors. 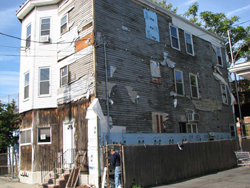 Improperly installed vinyl siding will buckle and warp, exposing your house to the elements and insects like termites. This can also cause leaks, allowing moisture into your home and potentially causing rot issues. Don’t risk your home to a flawed installation! When it comes to siding installation, trust in professionals like Northshore Window and Siding. With 24 years of experience and expert certification and training, we have the knowledge and skill to perform a beautiful, sound, safe siding installation every time. The qualified siding contractors at Northshore Window and Siding provide a superior installation and great customer service to leave you 100% satisfied with your attractive new siding. 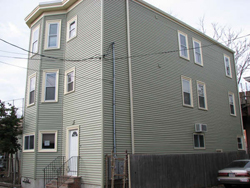 At Northshore Window and Siding, we install all types of vinyl siding, even foam insulated siding. We are a full service siding contractor, meaning we offer complete exterior installation including trim, soffits, facias, and even foam board insulation if you’re concerned about temperature control/draftiness. If you’re not sure what type of siding or trim is right for your home and family, we’d be happy to help! We can provide information and samples as well as an estimate to help you determine the perfect exterior siding for your house. Vinyl siding is the most popular exterior look for homes in North America. This durable, low maintenance material is both attractive and affordable. Vinyl comes in a huge selection of colors and offers a wide selection of coordinating trims. Northshore Window and Siding offers several different options in vinyl siding, including CertainTeed Monogram 46L, Cedar Impressions, and Cedar Boards Insulated siding. Each type of vinyl siding offers different benefits, including style options, insulation, and size. If you’re looking for an attractive but traditional look, try our line of Cedar Impressions vinyl shingles; this vinyl siding has the appearance of actual cedar shakes for a distinctive, classic look. Our Monogram 46L vinyl siding offers different benefits, mainly a more seamless finish (up to 35% fewer seams than with traditional length vinyl siding). The professional siding installers at Northshore Window and Siding can help you decide which type of vinyl siding is best for your home. Call today! One of the latest trends in siding technology, insulated vinyl siding is an attractive option that also includes the thermal benefit of added home insulation. You get the beautiful finish and low maintenance of traditional vinyl siding, but you also gain savings in reduced energy costs–manufacturer information states that your home’s R-factor can actually increase up to 22%! Your home will even be quieter inside after your insulated vinyl siding is installed as it reduces the amount of outside noise that enters your house. Additionally, the rigidity of insulated vinyl siding actually increases the strength of your building and offers impact resistance. Call Northshore Window and Siding today to learn more about the benefits Cedar Boards Insulated siding will bring to your home and family.